While on a road trip in California, driving from Los Angeles to Palm Springs, I came upon a stellar sight. As the landscape got drier, past the city limits and pushing into wide open space, I was greeted by miles of wind turbines at work. It was a beautiful sight; having never seen such a large display of them before, it struck me as a piece of landscape artwork. The grand display and the large number of units overwhelmed me with the idea that the planet was at work, and in front of me was a way for us to harness energy and put it toward a greater good. I know I’m waxing philosophical, but we are all subject to being humbled in the presence of large gestures such as these. On a recent warm summer morning I drove out to the West Campus of Chippewa Valley Technical College, off of Highway 12, and met with Adam Wehling, associate dean of agriculture and energy, to learn more about the wind turbine installation they have upcoming at their Energy Education Center. The campus is already an impressive display of buildings and equipment used with their curriculum for rescue, HVAC, and agricultural training. North of their newly redesigned building is a large low pitch. Standing in front of small collections of pines, Wehling told me more about the 90-plus-foot tower that will stand there, generating wind power and sending it back to their internal grid. 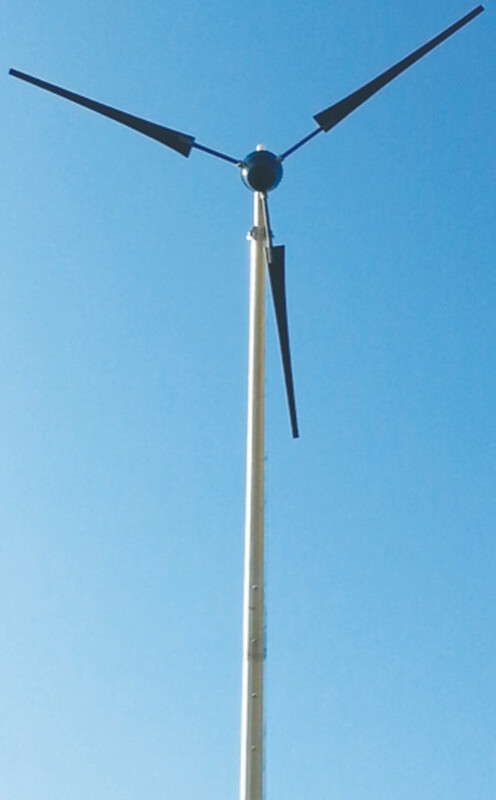 The Ventera Wind VT10 Wind Generator, the first turbine of its kind installed in the city, is in the “small wind” category. “Small wind is defined as wind turbines with a capacity rating of less than or equal to 100 kW,” according to the American Wind Energy Association. CVTC's 10-kW turbine, with its 11-foot blades, could generate up to 10,000 kWh annually, enough to supply the maintenance energy their building needs for one year. The pole will travel on a semi-truck to campus with the blades arriving by box truck. It will be fitted with a hydraulic cylinder to lower the conduit down for repairs and study. Noise produced by the turbine will be masked by wind noise. It can operate at wind speeds up to 130mph and will self-manage itself to quicken or slow based on power absorption. Now that the Eau Claire City Council has approved the project, the foundation and pole should be installed by August with the generator installed and operational come September. The new large-scale turbine will be a hands-on educational tool to teach students how to install, regulate and repair a wind turbine. It is also a fine example to the large and small energy cooperatives in our area of what is possible in the region with the generous space and natural resources we have available.